This lower body routine will definitely work your hips, glutes and outer thighs. Enjoy. (Increases the flexibility and mobility of the hips) Lie on your back with your hands at your sides straighten your left leg up to the ceiling, the right knee is bent with your right foot firmly planted on the mat. Keep your neck long and shoulders down and away from neck. On an inhale, circle the leg across the body down and around, exhaling back to the start position. Keep your left hip rooted into the mat, abdominals pulled in and up. Circle 8 times in each direction. Switch legs and repeat. (Strengthens hamstrings, back extensors and gluteals and stretches the quadriceps). Lie prone with your head and torso lifted, with your fists together press your forearms in to the mat. Your legs are straight and close together and your shoulder blades down and back. Tighten the buttocks while pressing your hipbones into the mat inhaling bend one knee and pulse the heel towards your buttocks with a quick double beat. Keep your hips still and keep abdominals pulled in. Exhale and switch legs. Perform 6 double beats each leg. Side Leg Lifts (Strengthens hips abductors). Lie on your side and align your body against the back edge of your mat. Prop your head in your hand and place the other arm on the mat in front of you. Now place your legs at a 45 degree angle, so that you are in a slight pike position. Rotate your top leg slightly so that your kneecap and the top of your foot face the ceiling. On an inhale lift the top leg up towards the ceiling. Keep shoulders and hips stacked on top of each other and the spine straight. Exhale and lower the top leg to the bottom with resistance. Imagine your top leg pushing through quicksand. Repeat 10 times on each side. Side Leg Circles (Strengthens hips abductors). The same starting position as the Side Leg Lifts, keep the legs at a 45 degree angle. Inhale and left the top leg to hip height and begin making small circles, allowing the top heel to brush past the bottom each time. Perform 10 circles in each direction. Side Leg Kicks (Strengthens hips abductors, external rotators, and challenge your balance). Maintain 45 degree angle of the legs, shoulders and hip stacked with the shoulders down, abdominals engaged. Inhale and kick the top leg forward with your feet flexed and pulse it twice to the front, exhale and kick the top leg back with your foot pointed. Repeat 10 times. Side Leg Bicycle (Strengthens hips abductors, external rotators, and challenge your balance). The same starting position as above. Extend the top leg forward, foot pointed, then bend the knee in, aiming the heel toward the buttocks, extending the leg behind you. Repeat “pedaling” motion 6 times in each direction. (Strengthens hips abductors, external rotators, and challenge your balance). Lie on your side with the bottom hand under the head with palms facing up. Place your other hand in front of you for stability. Keep your legs straight and in line with torso. Inhale and lift your arm, head, torso and legs to the ceiling, pause 3seconds, exhale and lower. Repeat 8 times on each side. 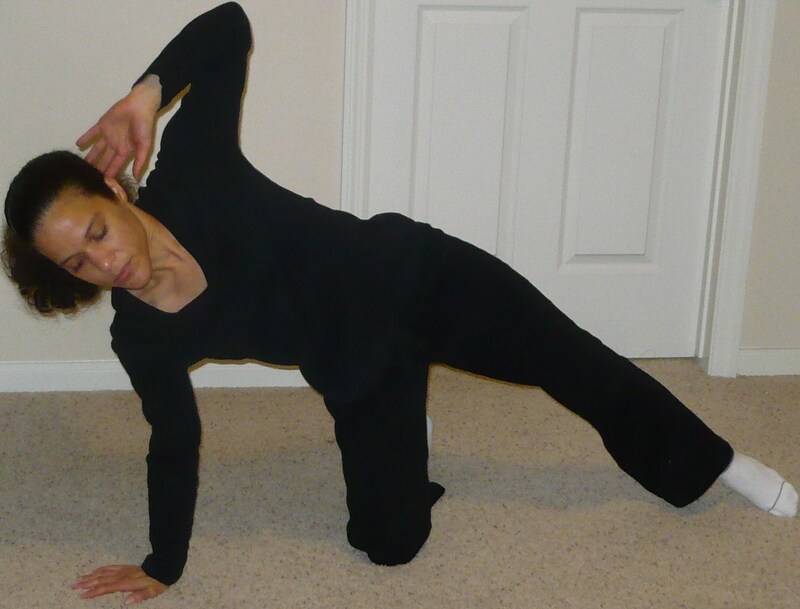 (Strengthens abductors and obliques, challenges core stability). Start in a kneeling position and lean to your right side, placing your right hand on the mat. Extend your left leg out to your side, foot flexed. Place your left hand behind your head, keeping elbows wide. Tighten your abdominals, extend your left to the ceiling, lift and lower leg with control 10 times. 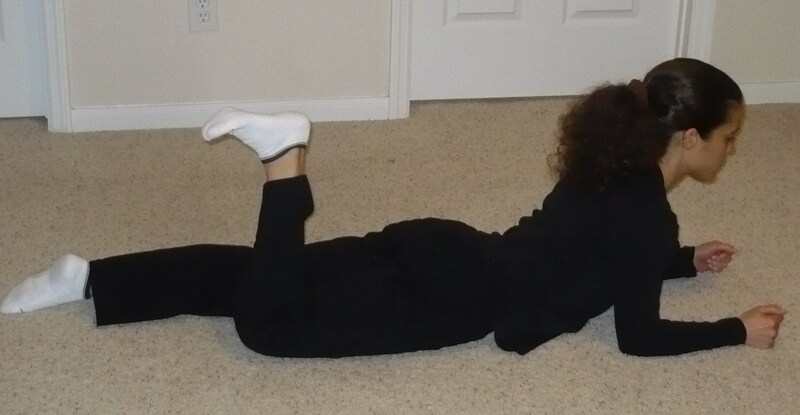 Then lift leg back out to the side, keeping your leg straight and foot flexed, kick to the front and then to the back. Repeat 8 times and switch sides. The side leg series above is best performed all on one side first, if you want a more intense lower body workout. Stay tuned for a few stretches that you can do at your desk. I posted a new workout in my work out section. Let me know what you think about the routine.